A four-month-old female infant presented with heart failure and cyanosis. On echocardiography, there was no outlet to the right atrium except an atrial septal defect and the left atrium drained into the respective ventricles by two atrioventricular valves. The case is reported for its rarity, with a brief literature review. Double-outlet left atrium (DOLA) is a very rare congenital heart defect, wherein, the left atrium drains into both the ventricles, and the only outlet for the right atrium is the atrial septal defect (ASD). The status of the left atrioventricular valve (AV) can be variable in this setting, and the term DOLA has been used somewhat differently by authors. Only a few isolated cases are reported in the literature. ,,,, We report a patient with DOLA in view of its rarity. A four-month-old, female infant, weighing two kilograms, presented to us with failure to thrive and easy fatigability during feeding, since birth. She had two episodes of lower respiratory tract infection in the past and had a history of mild cyanosis on crying. The physical examination revealed a heart rate of 124 beats/minute, blood pressure of 84/52 mmHg, respiratory rate of 32/minute with oxygen saturation (SaO2) of 92% in room air. A pansystolic murmur at the left lower sternal border and a split second heart sound were heard on auscultation. Mild hepatomegaly was noted. The electrocardiogram (EKG) showed left atrial enlargement, with left axis deviation, without ventricular hypertrophy. The chest radiograph showed cardiomegaly and increased pulmonary vascularity. A transthoracic echocardiography [Figure 1] and [Video 1] revealed situs solitus, levocardia, and d-loop ventricles, with normal pulmonary and systemic venous drainage. Well-defined right and left atria were present. There was right atrial outlet Atresia, with the only outlet for the right atrium being a secundum ASD. The left atrium emptied into the right and left ventricles through two AV valves. The right-sided AV valve had septal attachments and opened into the trabeculated right ventricle, while the left AV valve opened into a smooth-walled left ventricle. Thus, morphologically the right and left AV valves resembled the tricuspid and mitral valves, respectively. There was no significant AV regurgitation. There was a restrictive inlet ventricular septal defect (VSD) shunting left to right with a gradient of 40 mmHg [Figure 1]e and f. The great vessels were normal in origin and position. There was no right ventricular outflow obstruction. The left ventricular outflow tract (LVOT) was somewhat elongated [Figure 1]d. The coronary sinus and aortic arch anatomy were normal. She was planned for an initial pulmonary artery banding followed by total repair at a later date. However, she died at home from a possible chest infection few weeks after presentation to the hospital. Double-outlet atrium has been initially described as a condition, wherein, either the right or left atrium drains into both the ventricles. The anomaly is quite rare. Double-outlet left atrium (DOLA) is even rarer than double-outlet right atrium (DORA). Only few isolated cases of DOLA are reported. Von Mierop  initially described it as a variant of the endocardial cushion defect, with the assumption that the AV valve represents a common AV valve and the abnormality results from the extreme malalignment of the atrial septum. However, subsequently, different viewpoints and cases with variations in the pathoanatomy in both DORA and DOLA have been described. The unique hearts with double outlet atrium, thus present difficulties in nosologic characterization and precise terminology. Double-outlet atrium in the presence of atresia of one AV valve poses other thematic problems. Since the right AV valve is atretic, the left AV valve cannot be described as guarding a common AV junction, and hence, it is not a common AV valve. It is the left AV valve that has been embryologically divided into the right and left AV valves (morphologically like the tricuspid and mitral valves). Kiraly et al.,  suggested that in such a uniatrial biventricular connection, the valves might not be described as mitral and tricuspid valves. In a study of straddling AV valves with atresia of one AV valve, similar to our patient in some ways, they have shown that the valves are often abnormal and may influence the long-term surgical results. However, in our patient the AV valves were phenotypically quite like tricuspid and mitral valves, without significant regurgitation. Hearts with straddling of AV valves and one AV valve atresia often have one ventricle that is hypoplastic, and consequently, are amenable for univentricular repair only. , However, DOLA with two well-developed ventricles like the present case have been described previously [Table 1]. The conduction system anatomy in such hearts might vary compared to the normals. Some authors suggest that the term double-outlet atrium (DORA/DOLA) should be restricted to hearts with common or well-defined AV valves and not to hearts having straddling AV valves with atresia of one atrial outlet. , Others argue, as noted above, that the patent AV valve is not a common AV valve, and irrespective of the details, this valve is a straddling valve. A pragmatic classification proposed for DORA may be applicable for DOLA patient management. Notwithstanding these differing points of view, a systematic stepwise approach of segmental analysis for the three cardiac segments (atria, ventricles, great vessels) and the two junctions (atrioventricular, and ventriculoarterial), as always recommended for congenital heart defects, will clarify the anatomy and decide the treatment. The clinical presentation of this condition depends on the size of the atrial septal defect (ASD) and its associated anomalies. With a non-restrictive ASD, the clinical findings are similar to those of a large atrial septal defect; however, with restrictive ASD, the signs and symptoms are those of congestive heart failure. Cyanosis may be due to a complete mixing of blood at the atrial level or associated pulmonary stenosis or atresia. Other reported associations with DOLA include pulmonary stenosis or atresia, left superior vena cava (LSVC) to left atrium, ventricular septal defect, and AV regurgitation [Table 1]. The clinical diagnosis can be established by echocardiography, and angiography is rarely required. The treatment depends on the status of ASD and the ventricles. A restrictive ASD may require intervention to establish an interatrial connection. When the ASD is non-restrictive, the clinical course is more benign and the management depends on the status of the ventricles and the associated anomalies. Surgical treatment involves complete excision and reconstruction of the abnormal IAS, with patch closure of the defect to separate the left and right AV valves. A simple patch closure of the ASD, if the anomaly is not identified correctly, would be catastrophic. Associated anomalies are common and need management appropriately. In conclusion, we report an infant with right outlet atresia, in whom the left atrium opened into normal-sized ventricles. The DOLA may represent a ventriculoatrial malalignment lesion. We thank Professor Robert Anderson and Professor Richard Van Praagh for their advice regarding the pathoanatomy. 1. Horiuchi T, Saji K, Osuka Y, Sato K, Okada Y. Successful correction of double outlet left atrium associated with complete atrioventricular canal and l-loop double outlet right ventricle with stenosis of the pulmonary artery. J Cardiovasc Surg 1976;17:157-61. 2. Bini RM, Pellegrino PA, Mazzucco A, Gallucci V, Milanesi O, Maddalena F, et al. Tricuspid atresia with double-outlet left atrium. Chest 1980;78:109-11. 3. Susuki Y, Hamada Y, Haneda K, Horiuchi T, Ogata H. Double outlet left atrium with intact ventricular septum. Ann Thorac Surg 1988;45:332-4. 4. Naik AM, Nabar AA, Dalvi BV. Double outlet left atrium. Indian Heart J 1997;49:418-20. 5. Espinola-Zavaleta N, Vargas-Barrón J, Hernández-Morales G, Keirns C, Romero-Cárdenas A, Roldán J. Clinical and echocardiographic aspects of double-outlet left atrium. J Am Soc Echocardiogr 2002;15:86-9. 6. Van Mierop LH. Pathology and pathogenesis of endocardial cushion defect: Surgical implication. In: Dávila JC, editor. Second Henry Ford Hospital International Symposium on cardiac surgery. New York: Appleton-Century-Crofts; 1977. p. 201-7. 7. Coto EO, Calabro R, Marsico F, Lopez Arranz JS. Right atrial outlet atresia with straddling left atrioventricular valve. A form of double outlet atrium. Br Heart J 1981;45:317-24. 8. 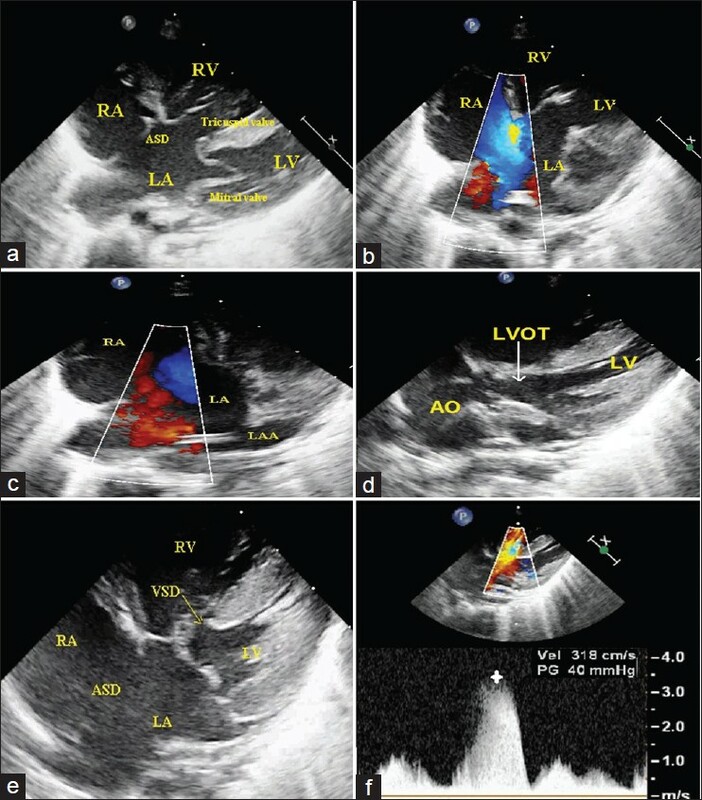 Beroukhim RS, Geva T. Echocardiographic features of double-outlet right atrium and straddling tricuspid valve with intact ventricular septum: A rare cardiac anomaly associated with pulmonary atresia and single coronary artery ostium. J Am Soc Echocardiogr 2010;23:580.e5-10. 9. Edwin F, Kinsley RH, Mamorare HM, Govendrageloo K. The spectrum of double-outlet right atrium including hearts with three atrioventricular valves. Eur J Cardiothorac Surg 2012;41:947-9. 10. Gnanapragasam JP, Houston AB, Anderson RH. Double outlet left atrium with double inlet left ventricle and discordant atrioventricular connection. Cardiol young 1991;1:155-7. 11. Van Praagh R. The importance of ventriculoatrial malalignment in anomalies of the atrioventricular valves, illustrated by "mitral atresia" and congenital mitral stenosis with large left ventricle. In: Doyle EF, Engle MA, Gersony WM, Rashkind WJ, Talner NS, editors. Pediatric Cardiology. Proceedings of the Second World Congress. New York: Springer-Verlag; 1986. p. 901-3. 12. Anderson RH, A Wessels, Vettukattil JJ. Morphology and morphogenesis of atrioventricular septal defect with common atrioventricular junction. World J Pediatr Congenit Heart Surg 2010;1:59-67. 13. Kiraly L, Hubay M, Cook AC, Ho SY, Anderson RH. Morphologic features of the uniatrial but biventricular atrioventricular connections. J Thorac Cardiovasc Surg 2007;133:229-34. 14. Westerman GR, Norton JB, Van Devanter SH. Double-outlet right atrium associated with tetralogy of Fallot and common atrioventricular valve. J Thorac Cardiovasc Surg 1986;91:205-7. 2 What are double-outlet left atrium and double-outlet right atrium? Authors of Document Van Praagh, R.
3 result 2 Document How best to explain unexpected arrangements of the atrioventricular valves?